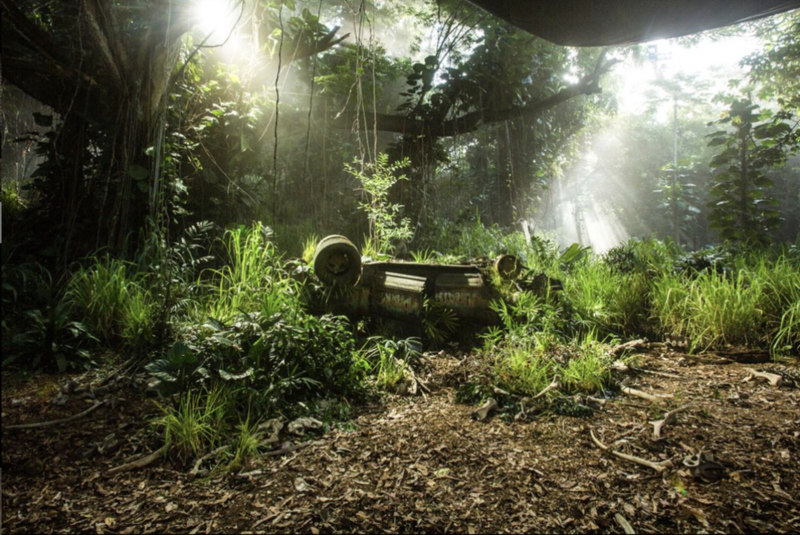 Welcome back to the second part of my sit-down with Andy Nicholson – Production Designer on Jurassic World: Fallen Kingdom. If you missed the first part of our sit-down, you can check it out HERE! Following the introduction to Andy’s work and how he got into the industry, we then, of course, had to dive into some deep Jurassic World talk. Andy did an incredible job nailing the sets for the film – with lots of intricate details that I really wanted to take the opportunity to pick apart. 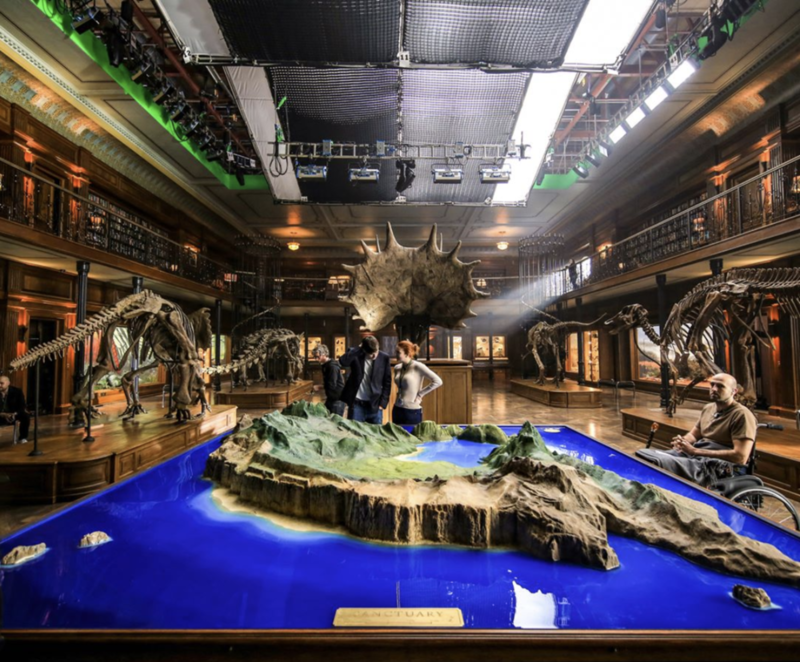 We talked a little bit about my experience about my visits to the Fallen Kingdom sets in the UK – particularly those at the the MOD (Ministry of Defence) site in Minley and how the logistics of such a location work when getting assets, etc. to where they are needed for filming. “It’s quite good using a military location as they run the place like clockwork, and they also tend to have quite good infrastructure so vehicles, etc. can access the location for training exercises. I do remember, however, that we turned up for one location scout and found ourselves in the middle of a battle. We were walking through our future exterior Lockwood house when suddenly, fifty infantry emerged from the bushes, charging and screaming, firing blanks at fifty other infantry who were about a hundred and fifty yards away. The Officer who was overseeing the exercise had just told them to ignore us, we all kind of stood there, like lemons, in the middle of a very loud battle exercise...it was memorable! Minley was a great location. Lockwood House in the film is in Northern California as it made sense for the animals to be transported there from Nublar, they’d have a big country to escape to at the end of the film! The challenge therefore, was finding redwoods and Northern Californian-style nature in the UK. There isn’t a lot of that kind of stuff in the here but much of the property owned by the MOD in Surrey has the Scots pine trees and they work. We also needed to find a building to use as the exterior of Lockwood House. We ended up finding this at Cragside, a National Trust property in Northumberland. Cragside was an amazing location! We had looked at a lot of alternatives but wanted something which could double for Victorian American architecture. Cragside was built in 1863 as a country getaway for industrialist and inventor William Armstrong. An engineer, scientist, and philanthropist, Armstrong is remembered as the father of modern artillery. In 1880 Baron Armstrong called upon architect Richard Norman Shaw to transform his house into a state of the art mansion, an elaborate country house in Tudor style, incorporating a science laboratory and even an astronomical observatory! Armstrong was also a passionate Americanophile. He had visited Northern California, and loved Redwoods, Sequoias and the other flora alongside American architecture. He got his architect to incorporate features of both in the interior and the exterior of the building, and then planted Redwoods and Sequoia around the entire area of his home. So, turning up there one hundred and fifty years later all you can at first see is empty Northumberland moorland but then suddenly it’s as if someone has just dumped a load of Northern California in the valley. It was incredibly surreal & it was perfect! At this point – I mentioned how the stuff which was filmed at Blackbushe Airport in the UK had made it onto Google Maps, which Andy Chuckled at as he mentioned they had only actually filmed there for a day. While we were talking about Hawaii, Andy shared some interesting facts about Blue’s Nest with the Ford Explorer. “I’d like to say a big thanks to Universal for letting me share these photos. I’ve seen a fantastic response from fans, and it’s nice getting to highlight some of the smaller details that weren’t necessarily as prominent on screen. It was quite funny as well, as at one point we were talking about requests for photos, and Andy mentioned how us Jurassic fans are notorious for asking for the smallest and most intricate details which won’t mean much to anyone unless they are a massive fan of the franchise and want to know every little intricacy. We then proceeded to talk about one of Andy’s most nostalgic touches – the model of Jurassic Park which features in Lockwood’s room. “The room that was Lockwood’s Bedroom was also used for Mill’s Office, so it was a really big room to transform into a bedroom which suddenly had a lot of space. We had lots of discussions on set about small details which we could fill the space with – and I then suggested a model of Jurassic Park. It was partly inspired by the model of the Sanctuary Island which was in the Diorama room, but also partly inspired by the fact that at one point in the script, Maisie was playing with a model of the original Jurassic Park in her bedroom. It kind of got moved and changed from that, which eventually came to him having it in his room. It was nice, as we were then able to get these old photocopies of the original blueprints from the first film. So, we used the original blueprints of the Visitors Centre and Raptor Pen which were built in Hawaii. Everything from the layout of the lake and the other detail were based on this Blueprints as well. “It was one of many skeletons we hired which we added into the film. Being able to add dinosaurs which hadn’t been seen before was the reason why I enjoyed working on the diorama room so much. I mean – if you were into dinosaurs, wouldn’t you recreate scenes and have these sculpted things made for you? There was some talk about them being taxidermy dinosaurs at one point I think, but that wasn’t the idea behind them. The idea was that they were fake recreations. The Concavenator, which is my favourite, came from when I was doing some research and discovered that the only fossil had been discovered near Barcelona, so it was a Catalonian dinosaur. With JA being from Spain and being Catalonian, I thought it would be a nice touch to add to the film as a nice tribute to him. That’s why this dinosaur really became the focus of the display. It’s a cool dinosaur – and I’m glad that we managed to get that one in. Make sure you come back for the third and final part of our chat with Andy soon. Whilst you wait for the final part – make sure to check out Andy’s website, and follow him on Instagram for more behind the scenes insight.